Potatoes were first taken out of Peru, where they originated, 458 years ago to feed the world. Half a millennium later, potatoes have spread throughout the planet but there are challenges to preserve the crop’s biodiversity as a source of food security, as well as the rights of the peasants who sustain this legacy for humanity. Last year was an annus horribilis for 52-year-old Newton Gunathileka. A paddy smallholder from Sri Lanka’s northwestern Puttalam District, 2017 saw Gunathileka abandon his two acres of paddy for the first time in over three and half decades, leaving his family almost destitute. Repeated volcanic eruptions of Mount Sinabung since 2010 have displaced thousands of people, leaving villages around the mountain deserted, with volcanic ash, lava and mud covering the soil, trees and empty houses. To take his mangoes to Shurugwi, 230 kms south of Harare, requires Edward Madzokere to hire a cart and wake up at dawn. The fruit farmer sells his produce at the nearest “growth point” at Tongogara (the term for areas targeted for development) where the prices are not stable. Almost half a decade of drought across most of South Africa has led to small towns in crisis and food imports for the first time in over 20 years, as well as severely hampering the government’s planned land redistribution programme. 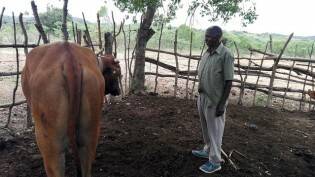 Albert Kanga Azaguie no longer considers himself a smallholder farmer. By learning and monitoring the supply and demand value chains of one of the country’s staple crops, plantain (similar to bananas), Kanga ventured into off-season production to sell his produce at relatively higher prices. Over 600 delegates representing at least 570 million farms scattered around the world gathered in Zambia from May 4-7 under the umbrella of the World Farmers' Organisation (WFO) to discuss climate change, land tenure, innovations and capacity building as four pillars on which to build agricultural development. As the World Farmers' Organization meets for its annual conference in Zambia to promote policies that strengthen this critical sector, IPS looks at how farmers across the globe are tackling the interconnected challenges of climate change, market fluctuations, water and land management, and energy access. ‘No Farmer, No Food’ is an old slogan that the Zambia National Farmers’ Union still uses. Some people consider it a cliché, but it could be regaining its place in history as agriculture is increasingly seen as the answer to a wide range of the world’s critical needs such as nutrition, sustainable jobs and income for the rural poor. Lawmakers in the Parliamentary Front Against Hunger in Latin America and the Caribbean decided at a regional meeting to work as a bloc for the passage of laws on food security – an area in which countries in the region have show uneven progress. St. Lucian farmer Anthony Herman was hoping that next year he’d manage to recoup some of the losses he sustained after 70 per cent of his cashew crop withered and died in the heat of the scorching southern Caribbean sun. Peter looked confused as he recounted how he’d painstakingly planted potatoes to sell and to feed his family of eight, only to find that when harvest time rolled around he had been greeted with tiny tubers not much bigger than golf balls.